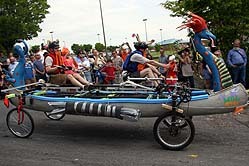 The New Age Viking Hill Master was a canoe atop a wheeled frame. 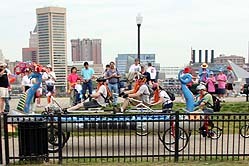 On land, they were powered by rowing—the only sculpture to do so other than Peter Stern’s Roadboat of 2003. Both were quite impressive, gave the pilots’ biceps quite a workout, and both broke down in roughly the same place, four years apart. 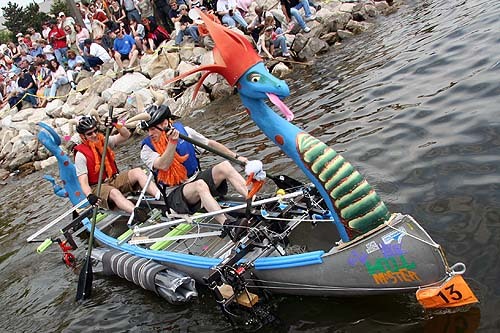 After a gearing breakdown, they cobbled things back together long enough to make it through the water and thoroughly impressed the crowd by heaving their sculpture out of the water without assistance. The Southern New England Weirdos (SNEW) of Worcester, Massachusetts came all the way to Baltimore, and we hope they return in 2008!